The picture below is a snapshot of my Davis WeatherLink strip charts for 7–9 January 2006. The highlighted region shows a marked temperature rise as the 8th was closing out, followed by a more normal temperature drop throughout the rest of the night. Temperature remained steady or slowly falling during the day of the 9th. In the top chart, the red line is the outdoor temperature, the blue is the wind chill, and the green is the dew point. In the next chart, the red is the wind direction, and the blues are the wind speed and hi wind. In the third chart, the cyan line is the outdoor humidity (the other two lines are indoor temperature and humidity). In the bottom chart is the barometric pressure (the blue line would show precipitation if there had been any). At 23:20, the temperature was 33.2° and by 00:00 it had jumped to 45.5°, where it leveled off briefly before topping out at 47.6° at 00:55. At the same time, the wind kicked up and swung from the east to a west-southwesterly flow. Even though the dew point had a sharp rise, too, it was not enough to keep up with the temperature and the humidity dropped rapidly. Once the pressure began to rise, the temperature began to fall, and everything slowly calmed down. By the way, we had some brief snow showers on Friday (the 6th), but never had more than a trace on the ground, even on mulch. Our first measurable snow since 16 December began around 21:30 on 17 January. Light snow fell steadily for several hours, ending sometime before 07:00 on the 18th, giving us a 2" blanket of white. Between 09:00-10:00 on the 18th, another ¼" of snow fell. Reminiscent of our Januarys in the Denver, Colorado, area, this brief bit of winter quickly succumbed to spring-like temperatures the next day (the 19th). The thermometer took less than 12 hours to climb from 24.1° (at 04:30) to 52.8° (at 15:55). Since then the temperature has remained above 50° (it is now 54.1° at 00:13 on the 21st), except for a brief dip from 15:25 to 19:35 on the 20th. During that time the temperature traced out a classic V bottoming out at 47° around 17:15 (see chart at right), as a compact area of light rain moved through Fort Wayne. Needless to say, the blanket of snow was completely removed in short order by the breezy warm air. This time, a rapid drop. After the “V” dip noted in my previous blog post, the temperature climbed to 55.6° (at 01:00 on the 21st) and stayed there for 40 minutes. Then the bottom fell out, oddly enough accompanied by a decrease in wind and only a slight shift in direction from WSW to NW (though the house would block a more southerly flow and probably skew it around to SW or WSW). At the same time, light rain began falling, continuing until nearly 5am when it ended as a brief period of snow (leaving only a trace on rapidly cooled objects). During this rapid temperature drop, sharpest between 01:45 and 01:50 when it dropped almost a degree a minute (from 54.5° to 49.9°), the temperature fell 19.4 degrees in 55 minutes. Daylight hours brought a brief reprieve; but, the day ended 31.4° degrees colder than it began. January 2006 will go down in infamy as the warmest January in Fort Wayne (so far). With records dating back to 1911, the January average temperature of 36.9° just barely beats the 36.8° recorded in 1932. The (now) third warmest January was 36.2° in 1933, fourth was 34.8° in 1990, and fifth was 34.0° in 2002. As a point of reference, the official average January temperature is 24°; so we were nearly 13° above normal! Interestingly, the average temperature at my house this January was exactly the same (see Jan 2006 Monthly Summary) as at the official NWS recording station at the Fort Wayne International Airport on the opposite side of town. Also of note, we managed to have the warmest January ever without setting a single daily high record. The closest we came was on the 19th, when we came within 3 degrees. Official snowfall was only 2.0 inches, the 10th least snowy January on record. However, the warmth increased the total moisture for the month; the official measurement of 3.01 inches made this the 20th wettest January. All day Saturday (from around 7am to around 8pm) it snowed. Unfortunately, the temperature remained above freezing the entire time. This, coupled with a record warm January keeping the ground from remaining frozen, limited accumulation to grassy areas. Guessing from the water equivalent, we had about 2" snow; though by the end of the day we struggled to keep 1" on the ground. We had some lake effect snow almost reaching us today, and perhaps that is what fell during the Super Bowl. It only amounted to ¼" of light powder (the temperature today stayed in the mid to upper 20s). Though this month has been more seasonal, February 16 was the warmest day so far in 2006, topping out at 59.0°. It was still 56.6° at 22:00, but then cooled quickly to 50.8° at 23:00. This after a weekend of slick roads when nearly an inch of snow fell in a three day period. Yeah, I know it’s pitiful. Anyway, at 23:00 the temperature accelerated its dive, dropping nearly 12 degrees in the next hour to 39.1° at midnight. Cold air continued to pour in on blustery conditions, bottoming out at 25.0° degrees at 08:20 when the sun finally overcame the cold air advection, at least for a little while. The temperature climbed back up to nearly 30° at 13:30 before heading back down. The temperature plot (right) reminds me of a profile of El Capitan (left), in Yosemite National Park (though the bend point on El Capitan is a little higher than on the temperature "cliff"). Update at 11:00 on the 18th --- The temperature began sliding once again after 23:10 on the 17th (24.1°), winding up at 6.3° at 08:10 (making the 18th the coldest day so far in 2006). A breathtaking dive of 52.7 degrees in 42.5 hours; almost all of that occurring during two eight or nine hour periods (with a fifteen hour break). Where the heck is winter? February 2006 did not make it into the record books; but, at least at my house, it didn’t miss by much in a couple of categories. The average temperature of 30.5° this February was 3.5° above normal, but almost a degree shy of the 20th warmest February (31.4° in 1987). Snowfall came within a smidge of making it the 20th least snowy February. That record still belongs to 1946, when only 3.3" fell, compared to the 3.35" that fell this year. Still, we had less than half our normal snowfall for the second straight month. How depressing. Unlike January, the warmth did not bring an abundance of moisture, and this February saw 0.55" less precipitation than normal (1.39" compared to 1.94"). The official statistics for February 2006 at the Fort Wayne International Airport show an average temperature of 29.8°, 4.8" snow, and 1.64" precipitation. The high temperature for the month, 59.0° (on the 16th) came within 3 degrees of a daily record (the closest we came to any daily record highs). More interestingly, that high came only three days before the low temperature for the month, 3.4° (on the 19th), which is also the coldest reading so far in 2006 (we didn’t even get below 20 in January!). Will we ever see above normal snowfall this winter? or at least normal snowfall? By the way, today (6 March) it snowed moderately several times; but never managed to completely cover the warm ground. We woke to about 85% snow cover (of less than ¼"); and though we had a couple of one to two hour periods of moderate snowfall, the snow cover remained steady until mid-afternoon when the snow turned to rain before the clouds began to break just before sunset. By evening, less than 30% cover (and still less than ¼"). Around 13:10 today (2006-10-02), a small cell producing pea-sized hail passed over the Northrop Grumman facility here in Fort Wayne. I estimate about 5-10 stones accumulated per square foot. Earlier in the day (around 10:40) an intense line of thunderstorms passed through the area, with frequent cloud-ground lightning. Rainfall has been briefly intense in these thunderstorms, but so far less than 0.4" has been received (at home & work). The radar loop shown here covers the period 10:03 to 13:17. Of particular note is the thin outflow boundary… the arc of precipitation along the south and southwest of the main rain area that sweeps steadily ahead of that area. Outflow boundaries are only occasionally strong enough to produce precipitation; this is a classic example of one that does. Although the overall movement of the rain area is southward, note that individual cells (once propagated) move easterly. It is only the "trigger line" that is moving steadily southward. As you can see from the surface map, this area of rain is isolated. There is no surface or upper-level low associated with it. Also, it is fairly cool; the temperature (and dewpoint) have remained in the upper 50s throughout the day. This seems earlier than normal for the first snow of the season here in Fort Wayne. I don't know how intense it got at home, but on the west side of town (at work) we had an intense snow shower, mostly pellets, around 1500 that lasted for about 10 minutes. At one point, mulch was completely covered with the pellets, which ranged up to nearly pea-sized. Visibility for a couple of minutes was reduced to less than ¼ mile. We had several other snow showers throughout the afternoon; but the temperature stayed in the upper 30s and this being the first time of the season near the freezing mark, the ground quickly melted all the pellets. The rain gauge on the roof at work registered 0.01" (no liquid precipitation fell today), and I can imagine that at least 0.05" of snow was received. Not really a “measurable” snow, but rather impressive for October in northeastern Indiana. On Sunday and Monday, the NWS was talking about “significant accumulations” for Thursday and Friday (today). On Tuesday and Wednesday, they were calling for 1–3" of snow today. Yesterday, they started their typical waffling, “We are not sure of the track of the storm.” By last night, they were expecting no more than an inch of snow today. We got a bit over 1" OF RAIN between midnight and 7am. Then we actually had (very brief) peaks of sunshine around 9am. Then the wind picked back up suddenly. It had been breezy between 3 and 6am (around 20mph), but had been below 10mph since then. We've had 20–30mph gusts since 9am here at work (on the west side of Fort Wayne, near I-69 and Illinois Road). Finally, about 11:20am a blob of snow moved up from the southwest and reached me at work. It is snowing intensely now, and the ground is beginning to turn white. This is quite a feat, since we have not had temperatures below freezing all week (actually, not below 50 until yesterday), and the ground must be well above freezing. UPDATE: we may have had ¼" of snow out of two snow squalls that moved through, but it never even completely covered mulched areas. The temperature dipped briefly below freezing during the squalls, but quickly rebounded to the mid 30s once they passed through. Very windy throughout the area, even downing a few scattered trees; but never much over 30mph at work. Even my sheltered anemometer registered a peak gust of 26mph today (shortly after 11am). The western suburbs of Chicago got up to 10". Some people have all the luck! That is not a good thing. The two dozen drivers involved in pileups on a short stretch of I-69 about 20 miles SSW of Fort Wayne this afternoon probably wished the band of snow had been a few more miles to the east as well. As it was, from just east of downtown to about thirty miles west of Fort Wayne, bands of occasionally intense lake effect snow quickly dumped an inch of fluffy powder several times today. The snow conveyor stretched from Lake Michigan to about as far south as Bluffton, IN. Indeed, it was the sudden southern edge of that intense snow that caught northbound motorists off guard. Then, after nearly a dozen vehicles had piled up in multiple crashes in the northbound lanes, southbound rubber-neckers on the slick roads set off another series of crashes involving another dozen vehicles. At home, we had a dusting overnight (sometime between 0100 and 0700) and then just caught the eastern edge of that conveyor belt of snow, getting perhaps a ½" of powder. At work, there was nearly an inch on the ground when I arrived around 0900 this morning, and then another couple of inches came from two rounds of snow, late morning through noontime and then from about 1500 to 1700 as the conveyor belt slowly swayed east-west throughout the day. I haven't seen official reports, but judging from the radar today, Rochester IN is probably as far west as the western edge of the snow belt swung. Using NOAA’s handy Water Equivalent of Snowfall chart, we probably had about 0.03" moisture content here, while on the west side of Fort Wayne (at work) they had between 0.13--0.20". By the way, parts of southwestern Michigan received up to 9" of lake effect snow. Sigh, always a bridesmaid! Here is an image I composited showing the snowfall pattern over northern Indiana. The yellow shading indicates snow cover, with the brightest yellow being the deepest snow. Downtown Fort Wayne lies on the eastern fringe of a very sharply defined swath of snow extending southeastward from Lake Michigan. The pile-up on I-69 was in the swath of snow that borders Bluffton (in Wells County, south of Fort Wayne). I-69 travels along the border of Wells and Huntington counties; the accidents occurred in the snowy area along that boundary and to the south of the river (the Wabash River) shown on the map overlay. As you can see, the lake effect snow extended a lot further than I originally surmised. The one band that passes just west of Bluffton extends as far south as the Dayton, OH, area (actually halfway between Eaton, which is visible in this image, and Dayton). I used AVHRR data (taken by NOAA's Polar Orbiting Satellites) which I downloaded from the John Hopkins University Advanced Physics Lab website. This is data from the Day Pass of NOAA-18 stamped 2006 Dec 08 19:04 UT (in JHU/APL Northcentral US section). See the full image here. 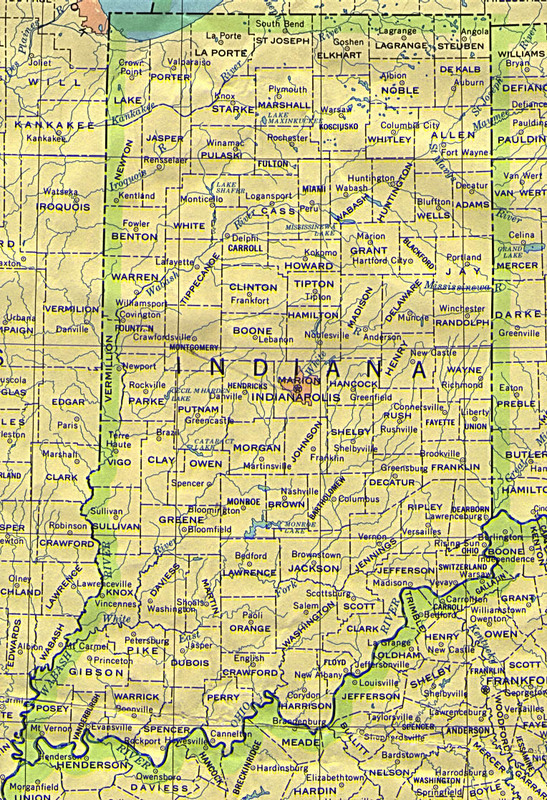 I used an Indiana map obtained from the University of Texas Perry-Castañeda Library Map Collection. I enlarged the AVHRR image a bit and enhanced it some to make the snow stand out better. I rotated and scaled the Indiana map to fit the state outlines on the AVHRR image. Finally, I overlaid the AVHRR image with the state map, and made the map transparent so the AVHRR data would show through. Most of Christmas Day was cloudy with periods of light rain. Around 1500, the rain mixed with huge snowflakes (more like snow clumps). This lasted for about twenty minutes, and covered everything with less than ¼" of slush. A little after 2300, I noticed the rain begin to mix with snow again. Now, at 0100 on the 26th, we have had perhaps an hour of wet snow that has left about ½" on the ground. The streets, warm from a couple of weeks of above average (and above freezing) temperatures, are only wet. From the radar image (courtesy of The Weather Underground) at right, you can see the area of snow creeping slowly up from the southwest, with some moderately intense areas of snow headed in our direction. The official forecast (heard earlier this afternoon) was for one or two inches of snow after midnight. We can only hope that this time they are wrong on the low side! Update --- by 0230, the snow had changed back to rain and probably stayed that way. By morning’s light (so I was told, I wasn’t awake to see it) there was no trace of snow on the ground.